Need a festive dish to share at a Halloween party or a fall birthday party? Then here is just the dish for you! 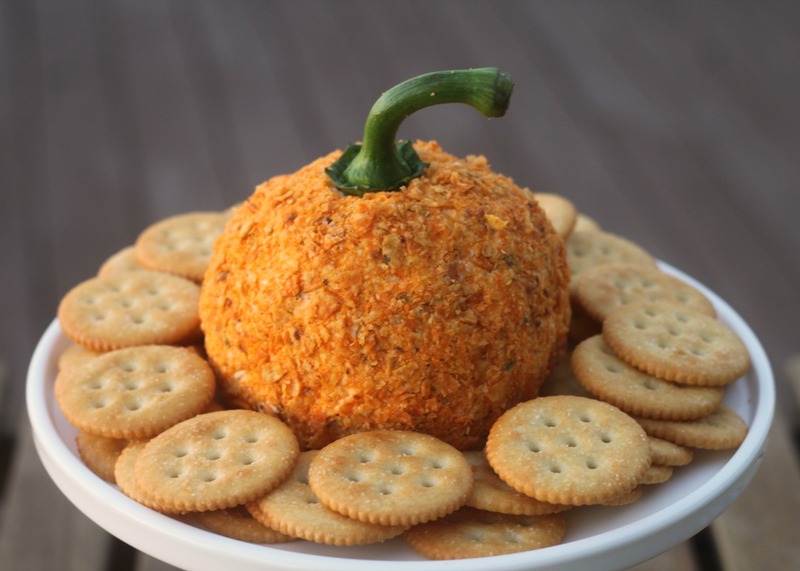 This idea of a Pumpkin shaped cheese ball comes to you courtesy of my neighbor ( Hi Dawn!) She is going to take a Festive Pumpkin cheese ball to a birthday party this weekend. The original idea comes from The Food Network although the cheese ball they use for their pumpkin cheese ball is a different flavor than mine. For the cheese ball I used my favorite go to Jalapeno Popper flavor. This is similar to the recipe I used for Jalapeno Popper Stuffed Mushrooms. Mix together the cream cheese, jalapenos, bacon, cheddar cheese, garlic powder and onion powder until well combined. 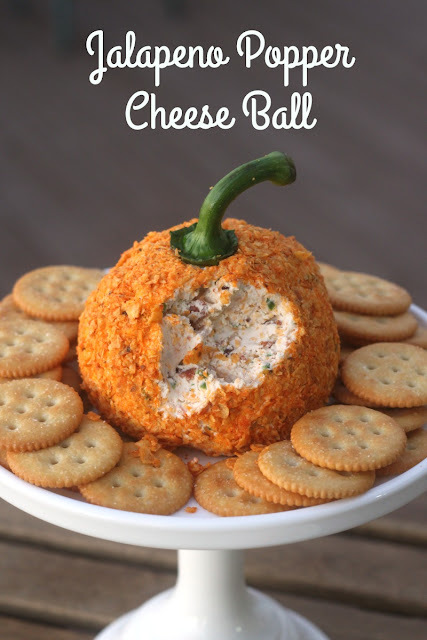 Place cheese ball mixture on a piece of plastic wrap and use the plastic wrap to form into a pumpkin shaped cheese ball. I refrigerate mine at this point for 2 hours or overnight. This gives the flavors time to mingle and get all yummy. I also do not put my crushed chips on until later because I was afraid they would get soggy. Before serving, unwrap the cheese ball and roll it in crushed nacho chips to give the cheese ball a nice orange color on the outside of your pumpkin. Cut the stem out of the top of your pepper, Push the stem down into the top of your cheese ball for the pumpkin stem. Enjoy!!! Cheese ball can be served with crackers or black tortilla chips for the festive occasion. Omg Nina! This sounds amazing! My daughter would absolutely love this recipe. Thanks for sharing! This looks great! I wish I had one to nibble on this evening while I watch tv. I'll be featuring your cheese ball tomorrow night for "Best of the Weekend". Yum!! My family would LOVE this, I'll definitely give it a try! Thanks for linking up to Funtastic Friday! The old time custom of keeping up Hallowe'en was not forgotten last night by the youngsters of the city. They had their maskings and their merry-makings, and perambulated the streets after dark in a way which was no doubt amusing to themselves.